Our hand trucks are all engineered, designed and manufactured in Cadillac, Michigan and are made to the highest quality specifications. We offer exclusive warranties and unique designs that can’t be found anywhere else. The products at B&P are superior in quality and durability because we use the highest strength aluminum, strongest rivets and most advanced manufacturing processes. Simply put, B&P manufactures the best built and best backed material handling equipment in the industry. 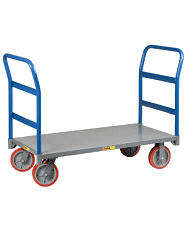 Didn't find the hand truck you're looking for? Build your own hand truck.